Central desktop is good if you have a small list of tasks. As you grow, CD becomes useless as all the tasks are listed on the same page and it takes a realllly long time to load that page with all those tasks. There is no way to archive or hide completed tasks. So if you want to use Central Desktop, use it only if you are a small company and your task list will only have a couple of tasks. True. 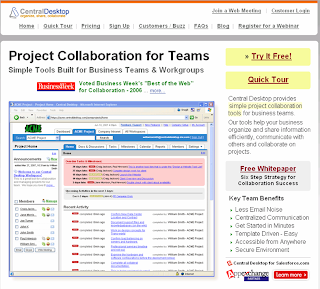 Centraldesktop is not enough if you work on multiple projects or work with several groups. It doesn't provide the thread view feature for tasks, which I think is important for collaboration. On top of that, you cannot assign rights to each group or individual. If your team consists of more than five members or the tasks and members are inter-connected, I recommend Ubidesk or Huddle. Apollo includes project management and CRM. It offers cases&deals, timers, a powerful calendar. It's basically an integrated solution. Pricing model is completely ridiculous jumping from $99/mth for a mere 10 internal users to a whopping $299/mth for a mere 20 users!! Ridiculous for what it does. Should be more like $99/mth for 25 internal users. Over the longer term it's actually more cost effective to create a custom PM site based on .NET. I recommend GoPlan as an alternative. PS> Also really bad service as emails go unanswered.